Brain circuitry. 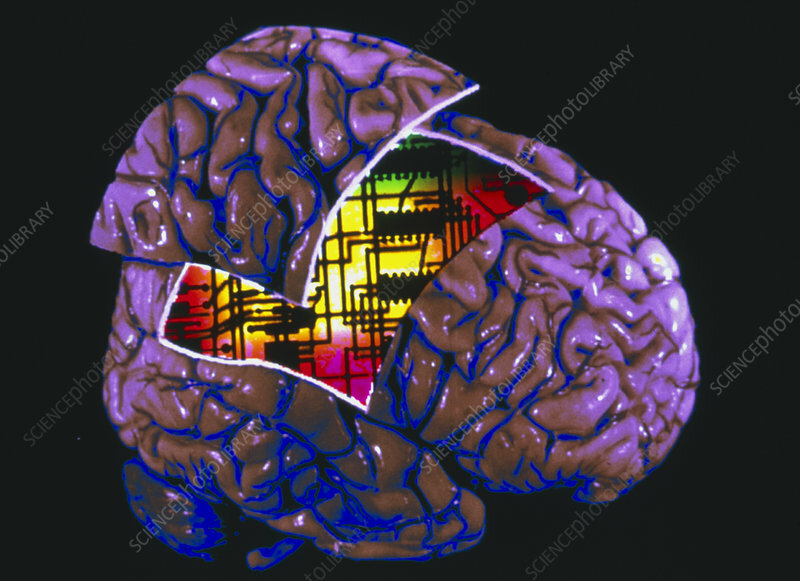 Abstract image of a coloured three-dimensional magnetic resonance imaging (MRI) scan of a healthy human brain with surface lifted off to reveal an electronic circuit board. The front of the brain is at right. Circuit boards contain microprocessors such as silicon chips (black), used for rapid data processing. The image may represent the "wiring" of the brain with nerve fibres. Alternatively the image may represent the development of brain-like computers or artificial intelligence. MRI scanning uses pulses of radio waves to build "slice" images of the human body. Successive "slices" are built up into a three-dimensional image by a computer.